to significant losses of shifting comfort. A worldwide unique range of transmission oils for every vehicle fleet. Gear+ -Flushing Device: Flushing of transmissions with manufacturer-approved automatic transmission oil flushing device from our German premium partner. Gear+ -Filling System: Easy filling of transmissions due to special transmission filling system. 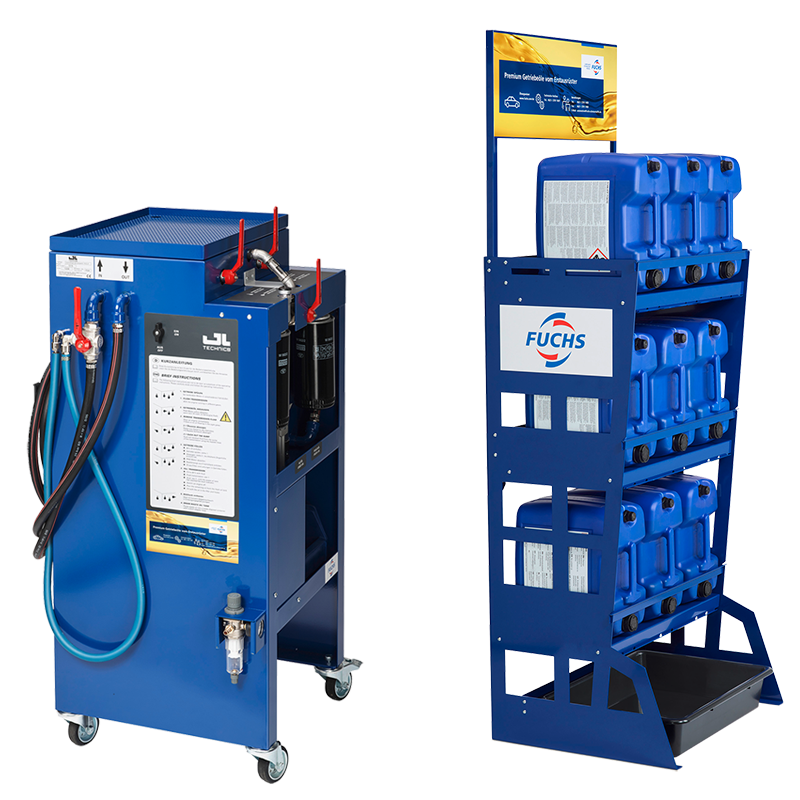 Gear+ -Display: Proper storage of FUCHS lubricants. Gear+ -Training: Training for the use of the automatic transmission oil flushing device. Gear+ -Video: Video for automatic transmission oil flushing. Other promotional materials (banner, poster, flyer etc.). With our partner GL GmbH, we offer you the optimal solution for your customers to effectively clean the automatic transmission by flushing the oil circuit and filling it completely with the appropriate fresh oil. For this purpose, specially designed devices such as the Gear+ are in demand according to manufacturer specifications. Build yourself a high-margin business- because there are currently only a few workshops offering this service. Increase the satisfaction of your customers with this automatic transmission oil service and the significant improvements in shifting behavior and a clear before-and-after effect. High-quality construction "Made in Germany"
FUCHS helps you to build this business successfully. Through comprehensive advice and on-site support as well as attractive conditions and suitable sales support we will help you to improve your customer loyalty significantly. Modern passenger car transmissions require modern high-performance lubricants for trouble-free operation over the entire service life, which protect the transmission from wear and significantly improve shifting comfort. The extension of the change intervals up to a lifetime filling also increase the requirements for the quality of the oils. As a leading development partner of the world's leading gear manufacturers, we are up to the minute and meet the required quality through a broad range of manufacturer approvals. Premium Performance ATF with reduced viscosity, especially developed to further optimize fuel-economy and gearbox efficiency of latest generation Mercedes-Benz 7-speed automatic transmissions. Not downwards compatible with previous MB-ATF-Specifications. Product dyeing: blue. Ultra High Performance ATF, specially developed to optimize shifting performance of Mercedes-Benz automatic transmissions. Product dyeing: red. Premium Performance ATF, specially developed to optimize the shifting performance of ZF automatic transmissions. Product dyeing: green. Ultra High Performance ATF, specially developed to optimize the shifting performance of ZF automatic transmissions. Product dyeing: none. The amount of vehicles ordered and delivered from the manufacturer with an automatic transmission has risen sharply; more and more vehicle models are being delivered exclusively with an automatic transmission. The reasons for this are the optimization of fuel consumption and thus the reduction of emissions, as well as increasing driving comfort. More transmissions, which are delivered with ATF oil, which is heavily loaded and worn over the service life of the vehicle, result in a strongly increased demand for ATF change and/or transmission fluid flushing. Our forecast: ATF service will soon be part of a standard with which you can offer your customers complete maintenance and problem solving at the same time - we will be happy to support you. Use the opportunity to inform your customers in detail about the maintenance of their vehicles. Do not forget: Your customers can’t be the specialists regarding ATF and rely on your knowledge and experience. Provide your customers with security through suitable service offers and suitable products. Learn more about the requirements of modern gear oils.